. September 15-22, 1999 (Floyd): Initially forming northeast of the Caribbean Sea on the 9th, Floyd steadily intensified into a strong category four hurricane, with sustained winds of 155 mph, as it approached the Central Bahamas, only three weeks after the passage of Dennis through the same area. 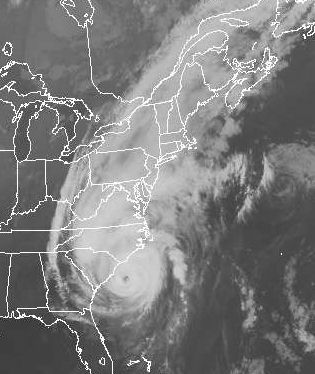 Slowly weakening thereafter, the hurricane made a northward turn towards the coast of North Carolina. To the left is a satellite picture on the system on the evening of the 15th. Winds of tropical storm force began lashing the Norfolk area during the evening of the 16th. The highest wind gust was 82 mph from the Chesapeake Lighthouse Buoy. Winds gusted to 60 mph at Langley Air Force Base at 9:55 p.m. on the 16th. Childrens Hospital, in the District of Columbia, gusted to 56 mph. The Mason Neck area of Fairfax had several trees uproot., one of which crashed through the roof of Senator Joseph Gartlan Jr.'s home....luckily, no one was injured. Almost 300,000 people statewide were left without power...some for up to six days after the storm. A bank robbery was partially foiled when rains caused the vandals to drop $2253 in small bills in Clarendon. Trees were downed in large numbers between Richmond and Norfolk along I-64. Arlington cleared 130 fallen trees....some were over a century old. In Washington, D.C., a vacant shop on New York Avenue NW collapsed due to rainfall collecting on the roof...scaring nearby residents with its loud crash. A tree fell onto a roof of a home. Trees fell in large numbers in Woodley Park. At Kent Island, rising waters floated away local utility poles. Up to 17" of rain fell at Hampton Roads. Sections of I-95 between Petersburg and Rocky Mount, NC and I-64 were closed for days due to flooding. Flood waters washed out part of Route 10 between the Isle of Wight and Suffolk at 6 a.m. on the 16th. Two dams burst along the Rappannock river due to the flash flood. To the right is an image showing storm total rainfall from Floyd, courtesy of the Climate Prediction Center (click on the image to get a clearer picture). A woman in Fairfax died when a tree fell on her car. A woman perished in Hanover county on I-95 in a traffic accident. In Accomac county, a man drowned when his car became stuck in flood waters. Another fallen tree claimed a victim in Halifax county. A massive flood inundated Zuni and Franklin with up to 12 feet of water on the 20th, when the Blackwater River overflowed its banks. Hundreds of secondary roads and thirty primary roads were closed, isolating extreme southeast Virginia from the rest of the state. In Franklin alone, 182 businesses and 150 homes were underwater, along with dozens of vehicles. It was considered the worst deluge in over 60 years. On the 22nd, waters finally began to retreat. 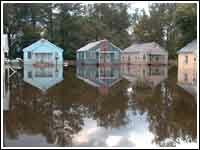 To the left is an image of some of the flooding that occurred in Franklin, taken by Liz Roll, of FEMA. In all, 9250 homes were damaged statewide. Total damage was estimated at $101 million in Virginia.